Type and method of drilling shall be selected depending on required water quality and amount, as well as considering geologic issues. “TOTAS” undertakes to provide private (individual) drillings and exploitation (industrial) drillings that are used for centralized water supply in the industrial objects, cottage villages, as well as on mineral waters. In order to ensure more comfortable living in the house outside the city, constant water supply is necessary. Often connections to water channel centralized networks are unimaginable option, therefore in such cases perfect solution is individual drilling. Relatively individual drillings can be divided in two types: shallow and deep. Usually shallow drillinghors are made on water-carrying sand horizons that lie 5-40 meters depth. Light drilling devices, UGB – 18C type, are used for the arrangement of similar drillings. Drilling is made with schneck or core tube. Drilling takes place in dry place. PVC or stainless steel pipe in 50-168 mm diameter is used as coating column, type of connection – thread or welded. Filter is chink perforated steel pipe, supplied with brass (PVC) network. Drilling exploitation is realized upon centrifugal immersed or vacuum upper pump with efficiency 0,5-3,6 m3/h. The aforementioned types of drilling are appropriate for water supply in private houses and summer cottages, as well as applicable for garden watering. As water carrying horizons in the upper are frequently polluted, mostly the water from such drillings is used for technical and household need and low-rate drinking water. Various purification systems must be used for drinking water. Exploitation term of shallow drillings is not long and limited to several years. Drillings get cloged up, therefore they need to be used constantly as much as possible, but not seasonally. Benefit of such drilling – comparatively low price for drilling construction works and the speed of drilling. Artesian drillings with 20 meters depth in dolomite or sandstone is the best option for autonomous water supply. In this case, drilling is made by rotation drilling device УРБ – 2А2 or URB 2,5, as well as rinsing of clay parts that is followed by cementization of area behind the pipe. Ecologically clean bentonite drilling fluids are used as washing fluids that exclude pollution possibility for revealed, water carrying horizons. High quality concrete solutions are used for the cementization of area behind the pipe that ensure safe isolation and exclude pollution possibility from opened surface of water carrying horizons. Depending on the task, drilling construction and diameter of covering pipes is selected. 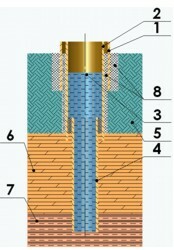 Perforated pipes ate installed directly in the interval of water carrying horizon. Due to the request of client, it is possible to install the drilling of stainless, galvanized or polyvinylchloride pipes. Pumping of the drilling is provided after finish of drilling works, that is followed by the analysis of water proof. The final stage is the issue of drilling certificate (passport), with stated warranty period, to the client. Regarding the drilling, “TOTAS” provides 2 years warranty. According to legal acts of the Republic of Latvia, construction of drilling with the depth exceeding 20 m must be licensed. We offer full set of services related to the coordination of drilling in various institutions. But complete list of objects where we have provided our services is quite longer!